This will be a quick post with a simple recipe. Crème Fraîche is a thickened cream that has recently gotten much press throughout the food blogosphere. It is similar to sour cream, but less tangy with an amazing but subtle nuttiness. Grocery stores like to overcharge you for this stuff, which is silly to me, since it is very simple (and kind of fun) to make at home. After making this recipe and tasting how delicious the homemade version is, I will never consider buying this from a store. I have also tried this other recipe that calls for heating the heavy cream, and it did not work for me. Instead of crème fraîche, I ended up with sour heavy cream - definitely not good eats. Below is the simplest recipe I have found for homemade crème fraîche, and it comes out beautifully. No heating, no fear of burnage, just mix, wait, and enjoy. 1. Put the cream and buttermilk or yogurt in a clean jar with a tight-fitting lid. Cover the jar and shake for a minute or so. 2. Put the jar on a counter in a warm location (I placed it on top of my water heater) and leave it for 12 to 24 hours, or until the cream thickens slightly. 3. When the cream thickens, place the jar in the refrigerator and let it chill for 1 day. 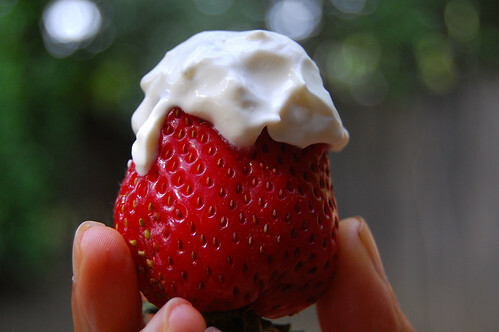 I abhor sour cream, so naturally I have thought about trying out crème fraiche. How sour is crème fraiche? It looks absolutely lovely! Did you add sugar to some of it for this strawberry? Great idea! I will definately try this! I can't buy creme fraiche where I am. Thanks for the recipe! mmm, a fine way to enjoy a juicy strawberry, although all i need is a spoon. Whoa I am SO glad to find this! Creme fraiche is super expensive here and I have no desire to buy it. Ever. But I always have greek yogurt around! Thank you Memória, Marcellina, grace, and Joanne! I would highly recommend this recipe. So easy and SOOO good. Memória -- the creme fraiche is definitely not as sour as sour cream. It's hard to describe exactly how sour it is. It is mild enough to be a topping for desserts (we ate it with pumpkin bread too). I also didn't add sugar when I topped the strawberries. If you aren't sure, just try a small amount -- it's probably better to do that anyway, as it only keeps for about a week. Fantastic recipe, I didn't know it was so easy. I have a jar of salmon roe in the frig that would go great with this. Just like Valerie, I could eat this with a spoon--especially with a little sugar added. Thanks for the easy instructions. By the way, I still need to make your cheese. I think about it almost weekly when I see a dish that calls for paneer (did I spell it right?). So maybe I'll do a homemade dairy product project this weekend. My Cauldron Boy is going out of town to see his family, so it would be perfect. It IS expensive to buy creme fraiche. I'm so impressed how relatively simple it is to make! I think I should make it and sell it to my family. LOL! My biggest problem is that I'm not able to even find creme fraiche in my grocery store. How wonderful to be able to make it at home! Thanks for posting this! It's my turn to move and my turn to get busy and my turn to be "inactive" for my blog. Oh my gosh. Is it really that easy?? Why I have I been buying it all this time! Living in the UK, crème fraîche is very easy to find (and cheap) - it's sour cream that's exotic and over-priced! Still, I like making my own yogurt for the better taste, so I'm going to give this a try too. Thanks for sharing! 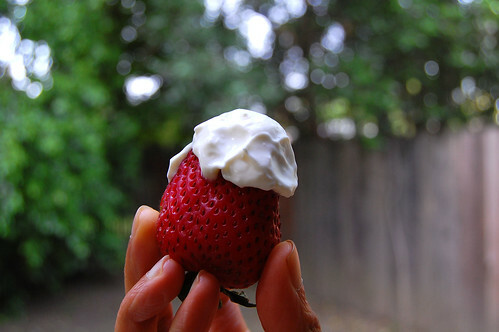 I'm going to make this with homamde buttermilk and try it on strawberries just like you have here (beautiful picture, by the way). Maybe add a little powdered sugar. I've always imagined that crème fraîche might taste like plain greek yogurt. Am I way off?? Popped in to say hi! That looks delicious! Martha's always saying serve with Crème Fraîche, but I didn't know it was this easy to make. Thanks for sharing! Does it have to be made in a jar or could you use a plastic container with a lid? Jennifer, I think it should be made in a jar and tightly sealed since it is important for it to not be exposed to air. Jennifer, don't use plastic. Use glass or ceramic. I used a good glass bowl covered with a plate, and it turned out perfect. After letting it sit out for a day I was a bit disappointed because although it was thicker than the cream that I started with it was still pretty thin. A day in the fridge and it's the consistency of comercial creme fraiche with a wonderfully subtle tanginess that really enhances foods.